Well, besides the fact that I have a lot of My Favorite Things to show you, I really love the new sets that just came out last night! Did ya'll see them? Were you at the WONKY release party on the SCS forum? Man, those threads were sure posting weird and out of order! So confusing! Anyway, here's another card I made using the Catch Some Rays set. It includes the cutest little beach umbrella, but I wanted her to get some "full sun" in this one, so I left it out and that's ok. I wish I looked so nice in a bathing suit. I haven't even bought one this year yet (last year's is now too little and it was my favorite!). It's just no fun, but I guess I'll have to get one eventually. Or do ya'll think I can lose about 40 pounds in a month in order to still have a chance to wear my old one before the kids go back to school? LOL!! I doubt it. Anybody want a milkshake? Anyway, the little tanning lotion needed a smiley face on it, so I drew that on myself. 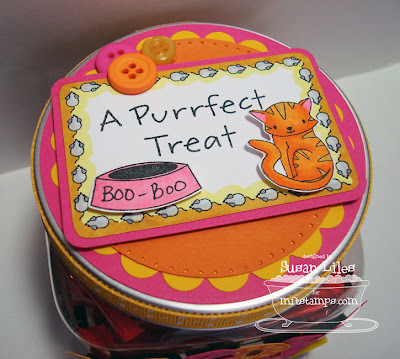 Next up, another Perfect Packaging Jar I decorated with the new Purrfect Treat Label set from Stephanie Fizer. I'm highly allergic to cats. I really don't like that fact, because I would get a kitty in a minute if I weren't. My eyes swell shut just looking at one. So when I got this assignment to make something with it and the new Perfect Packaging jars from MFT, I didn't know WHAT I was going to wind up coming up with. So I decided to go with the "truly purrfect" kitty treat--Chocolate Kit Kat bars! 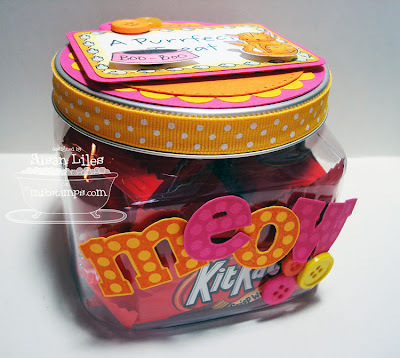 I added the "meow" with the Bling Bet set and cut them out for the front of the jar, and just decorated the top of the lid with the label set. Does anyone remember who BooBoo Kitty is? Another one of those, "I couldn't help myself" instances and HAD to make it that. So you're not a cat lover? Just hang tight, I've got a Puppy Project up my sleeve to show ya'll real soon! So it's Thursday Thoughtful day here at my house, and the girls have decided they are going to make lunch for ME today, rather than the other way around. (Can I get an "aaawwww"!) We'll see how that goes. Roast beef sandwiches can't make that big of a mess, can they? At least I've got some Kit Kat bars to fall back on. SUSIE Q-TIP: When needing to attach ribbon to an altered project, run it through one of those little Xyron "X" sticker makers. Super easy. BONUS SUSIE Q-TIP: Let your kids do something they don't normally get to do (with minimum supervision and age appropriate). They will feel so empowered and "big" and it gives you a chance to let them shine. You might even get "a best mom ever" award. These are gorgeous projects Susan! I love the new sets!